Tag line: "Justice isn't a crime"
Trivia: The film is dedicated to David John Mackenzie (1929-2015) and Ursula Sybil Mackenzie (1940-2015), the parents of director David Mackenzie. Both died while he was making this film. It’s a common practice for studios to hold back the release of their “awards” movies (films they’re convinced have a shot at winning big during awards season) until late in the year, primarily to ensure they stay fresh in the minds of voters. Of the nine movies up for Best Picture at the 2017 Academy Awards, eight debuted in U.S. theaters between the months of October and December. The lone exception is director David Mackenzie’s Hell or High Water (released Aug 12), and for good reason; a somber, sporadically exciting look at lawmen and criminals operating in the desolate territories of West Texas, Hell or High Water isn’t a film that anyone, voters or otherwise, will forget anytime soon. Divorced father Toby Howard (Chris Pine) and his ex-con brother Tanner (Ben Foster) are bank robbers, or at least they have been for a day or so. Hoping to reclaim their family’s ranch, which is a week away from being repossessed, the two concoct a very specific plan, robbing only the branches belonging to the Texas Midlands Bank (which is in the process of changing its surveillance systems, meaning the security cameras aren’t operative) and taking nothing but small bills from the cash drawers (to ensure they can’t be traced). After knocking off two branches their first morning out, they return to the ranch, bury the getaway car in a ditch they dug earlier, then head to a local Indian casino so they can claim they won the money playing cards. Toby, whose ultimate goal is to pay off the lien against the ranch and put the property in a trust for his sons, is extremely careful, sticking closely to the plan he laid out. Tanner, on the other hand, is a loose cannon who loves breaking the law, and his volatile nature often puts him at odds with his brother (while the two are out to breakfast that first morning, Tanner takes it upon himself to rob the bank across the street from the diner, netting them more cash but also jeopardizing the entire operation). Because each robbery involved less than $10,000, the FBI turns the case over to the Texas Rangers, leaving it up to Marcus Hamilton (Jeff Bridges) and his partner Alberto Parker (Gil Birmingham) to crack it. Marcus is weeks away from a retirement he’s not looking forward to, and passes the time poking fun at Alberto’s Native American heritage. Figuring the bank robbers aren’t done yet, the two Rangers hit the road, checking into a motel very near a Texas Midlands bank (seeing as there are only eight branches total, Marcus believes this location will eventually be a target). Marcus assures Alberto that, like all crooks, the thieves will make a mistake, at which point they’ll swoop in and arrest them. But then, Toby Howard isn’t your typical bank robber, and will more than likely give the longtime lawman and his partner a run for their money. 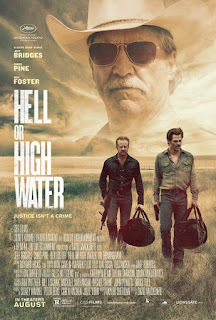 There’s a lot to admire about Hell or High Water, beginning with the performances delivered by its strong cast; Jeff Bridges is up for Best Supporting Actor for his work here, a nomination that’s well-deserved (though to be honest, Ben Foster’s Tanner Howard is as funny as he is frightening, and the actor is just as impressive as his elder co-star). Equally as noteworthy is the work of cinematographer Giles Nuttgens, whose camera captures both the majesty and tragedy of this area of Texas (blessed with spacious landscapes, but cursed with boarded-up homes and towns that are slowly dying), and David Mackenzie stages the bank robberies (as well as the getaways) in a manner that consistently ratchets the energy up several notches. Congratulations also to writer Taylor Sheridan, whose smart, witty script netted him an Oscar nomination for Best Original Screenplay. Yet what truly moved me as I was watching Hell or High Water was its theme of a dying west, a place cowboys and settlers once called home that’s now controlled by banks and big businesses. It shows up occasionally in Taylor Sheridan’s dialogue (while sitting at an outdoor table with Marcus, Alberto laments the fact that the entire area was taken from his ancestors several generations earlier, adding, rather remorsefully, that now it’s the banks taking it from the current owners), but director Mackenzie tosses in a few visual reminders as well; some obvious (shots of abandoned houses and empty streets), others more subtle (the Howard brothers pull into a gas station, and in the background is a guy climbing onto a horse, an image that’s obliterated when a green sports car, hip-hop blaring from its radio, arrives in the foreground), yet all equally as effective at getting the point across. Sam Peckinpah tackled this very subject head-on in 1969’s The Wild Bunch, in which aging western outlaws realized their way of life was fading quickly. Like Peckinpah’s classic, Hell or High Water approaches the topic with a hint of melancholy, a longing for a simpler time when the only thing separating the lawmen from the desperados was a badge. That’s the way it is in this movie; we understand what motivates Toby Howard, and hope that he somehow manages to get what he’s after, if for no other reason than to prove a man can, indeed, beat a corporation. In many ways, the Howard boys and the Rangers chasing them are kindred spirits, and it’s in exploring their similarities that Hell or High Water distinguishes itself as one of 2016’s best films.